Growing up in the Midwest, it's only natural for Dakoda Armstrong to follow in his strong family heritage as a fourth-generation farmer. He grew up helping his father run the family-owned farm, planting corn and soybeans. 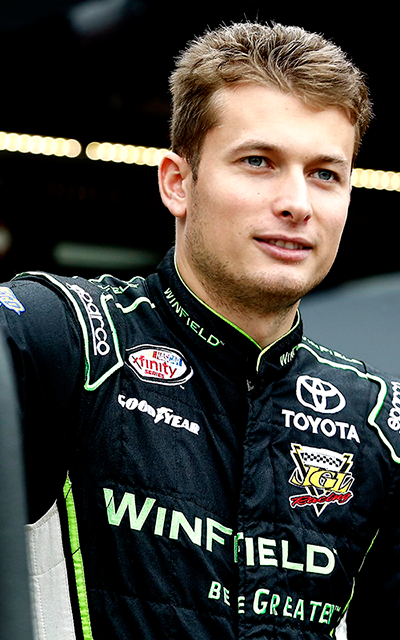 He also realized his love of racing at an early age too and climbed into a go-kart at age six. Armstrong won the 1998 World Karting Association Championship in just his first year racing. In 2004, Armstrong became the youngest driver to ever win a USAC National Championship title at just 13-years-old. Through his early days and his teenage years, he accumulated over 200 wins while competing in go-karts, quarter midgets, bandolero, micro/mini springs, Kenyon midgets, 410 non-wing sprint cars and midgets. His success in open-wheel racing gained him recognition in one of the biggest names in motorsports, Penske Racing, and Armstrong became a development driver for the organization in 2009. That year, Penske partnered with Cunningham Motorsports to field a car in the ARCA Racing Series for Armstrong for seven races. His first year in a stock car he earned a best finish of third and a total of three top-10 finishes. In 2010, Armstrong competed in ARCA full-time with Cunningham Motorsports where he earned his first win in just his 12th start at Talladega Superspeedway. He went on to win one more race that year at Salem Speedway. Armstrong earned the "Rookie of the Year" title and finished the year seventh in points with two wins, five top-five, 12 top-10 finishes and one pole. With a limited ARCA schedule in 2011, Armstrong still managed to post one win, two top-five and four top-10 finishes in just six starts. 2011 was the year that Armstrong signed with ThorSport Racing to compete in the NASCAR Camping World Truck Series (NCWTS) for part of the 2011 and 2012 seasons, earning one top-five and two top-10 finishes in 22 starts. Armstrong's extensive family background in the agricultural industry led him to the perfect partnership with WinFieldTM. WinField, a Land O'Lakes company, offers top-performing seed and crop products. Armstrong makes the perfect ambassador for their brand, on and off the track, with his ability to relate to WinField's growers and dealers. With WinField's sponsorship, it opened the door for Armstrong to compete full-time in the NCWTS for Turn One Racing in 2013. He piloted the WinField truck to one top-five and three top-10 finishes and 12th place in points. While the 2014 season will be Armstrong's first full-season in the NASCAR Nationwide Series with Richard Petty Motorsports, the Indiana-native has seven starts in the series. With the majority of his experience on mile-and-a-half tracks, Armstrong will look to veteran crew chief Philippe Lopez to guide him throughout the season. WinField will also join Armstrong at RPM as he competes for the Sunoco Rookie of the Year title along with a top spot in the point standings. Competed in the NASCAR Camping World Truck Series on a full-time basis. Finished 12th in the point standings with one top-five, three top-10 and eight top-15 finishes. Dakoda WON the pole for the ARCA "Talladega 250"
Dakoda was named the ARCA Stock Car Series "Rookie of the Year"
In his first ever race at Indiana's Winchester Speedway (Worlds Fastest Half Mile), at 16 years old, Dakoda qualified his sprint car 5th and finished an impressive 8th, against USAC's best National Sprint Car drivers! Dakoda WON the USAC Regional Midget Series event at Mount Lawn Speedway on July 16, 2008. Dakoda WON the USAC Regional Midget Series event at Plymouth Speedway on June 18, 2008. Stock Cars - In his first ever stock car race (Hooters Pro Cup), Dakoda drove from 28th to 10th, passing 18 cars. Not only was he "Rookie of the Race", but he was also the "Hard Charger", for passing more cars than anyone else in the race! Bob Nervo Memorial Lt-B - Champion - Toldeo, OH. Nascart Champion - Speedcreek, IN. Harold Lamberson Memorial Winner - Quarter Midget - Indianapolis, IN. Gasoline Alley, National Quarter Midget Champion, Indianapolis, IN. 3-Time Mini Indy Quarter Midget Champion - Indianapolis, IN. 2-Time Turkey Gobbler National Champion - Huntsville, AL. 2-Time Harold Lamberson Memorial Winner - Quarter Midget - Indianapolis, IN. Rookie Driver Micro Nascart - Speedcreek, IN. WKA National Champion - Camden, OH.